Moving to separate himself from the bitter atmosphere of Capitol Hill yesterday, Barack Obama made two 50-minute town hall stops in rural Illinois, proclaiming, "there is nothing wrong with our country. There's a lot wrong with our politics." 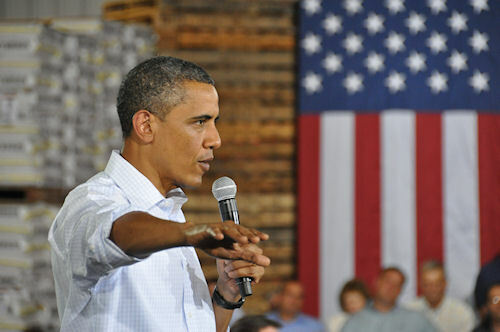 Obama, who appeared with rolled up sleeves, no tie and pleated khaki pants, made his first appearance at Wyffels Hybrids' 17,000-square foot warehouse in Atkinson, Ill. He later visited an agri-tourism business in Alpha, Ill. Both tiny towns are about 180 miles southwest of his home town in Chicago. MIDWEST SWING: President Barack Obama wrapped up his three-day swing through the Upper Midwest with a stop at Wyffels Hybrids. During his brief speech and question-answer session with an audience of about 200 in Atkinson, the President displayed a good grasp of agriculture issues. He supports pending free trade agreements with Korea, Panama and Colombia. After a youngster asked about his grandfather's ethanol plant, the President said he supported biofuels but that the country needs to diversify to cellulosic ethanol, which would use waste materials or switch grass as a feedstock. "Food prices are going up, but only 4% of that is because of corn going into ethanol," he said. "But, as you see more demand from China, it's going to be more important to find ways to make ethanol without effecting our food supply. "I want to be number one in alternative energy, and that's going to be good for the farm economy," he added. "There's no reason we should fall behind to a country like Brazil." From a political standpoint, The President seemed to be shifting blame for the recent debt ceiling fiasco to all of Congress, not just Republicans. He urged the crowd to talk to their Representatives and Senators, and send a message to stop the partisan bickering. "We should extended the payroll tax cut. We could renew it right now….the only thing holding us back is our politics. We could refinance right now and start infrastructure projects all over the country. The only thing holding us back is our politics." Obama, paraphrasing Lincoln's house divided speech, said, "When this country is operating on common ground, no one can stop us. But when we're divided, we have a whole lot of self-inflicted problems. It's urgent that we join together and not think about party first…but put country first." Even so, he concluded on a positive note. "Don't bet against America," he said, to rounds of applause. "We've gone through tougher times before, and we've always come out on top."